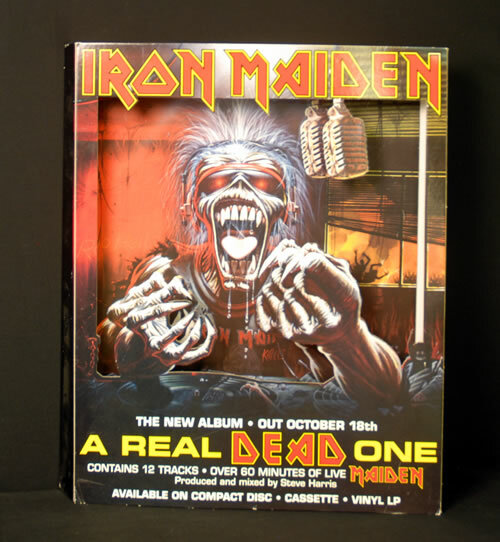 IRON MAIDEN A Real Dead One (Super rare and quite spectacular 1993 near vintage EMI promotional only instore display unit. Standing some 25.5" high by 23" wide, this display opens up slightly to create a 3D effect display 'box'. It still has the original fold out stand to the back and is in an amazing condition for a 22-year old piece; the cut to shape parts are intact and unbroken. This is the only one of these we have secured to date, don't miss it! ).